Sadness Circuit Found In Human Brain : Shots - Health News When people are feeling glum, it often means that brain areas involved in emotion and memory are communicating. Researchers now have observed the circuit in action in humans. Patients awaiting epilepsy surgery agreed to keep a running log of their mood while researchers used tiny wires to monitor electrical activity in their brains. The combination revealed a circuit for sadness. A study of 21 people found that for most, feeling down was associated with greater communication between brain areas involved in emotion and memory, a team from the University of California, San Francisco reported Thursday in the journal Cell. "There was one network that over and over would tell us whether they were feeling happy or sad," says Vikaas Sohal, an associate professor of psychiatry at UCSF. Previous research had established that sadness and other emotions involve the amygdala, an almond-shaped mass found in each side of the brain. And there also was evidence that the hippocampus, which is associated with memory, can play a role in emotion. But Sohal and the other researchers were curious about precisely what these and other brain areas are doing when someone's mood shifts. "We really wanted to get at, you know, when you're feeling down or feeling happy, what exactly is happening in the brain at those moments," Sohal says. You can't get that information from brain scans, which don't capture changes that happen in fractions of a second. So the team studied 21 people who were in the hospital awaiting brain surgery for severe epilepsy. Before the surgery, doctors insert tiny wires into the brain and monitor its electrical activity for up to a week. Sohal says the team hoped those recordings would help answer a basic question: "When patients are sitting there, or watching TV or talking with their family or waiting or being anxious, which regions of the brain are talking to each other?" The patients agreed to keep a running log of their mood. And the team looked to see whether certain moods coincided with communication within specific networks in the brain. The researchers thought they might find networks that were similar in a couple of people. But they were "really surprised" to learn that 13 of the 21 patients shared the same network, Sohal says. Still, he says, it makes sense that communication between areas involved in memory and emotion would be associated with sadness. "Maybe you're feeling down and so you start remembering times in your life when bad things have happened, or you are starting to remember those experiences and that is what is making you feel down," he says. The study couldn't confirm that. It also couldn't show whether the increase in communication was the result of a mood change or the cause of one. Even so, Sohal says the finding may bring comfort to people with depression. "As a psychiatrist, it's incredibly powerful to just be able to say to patients, 'Hey, I know there's something happening in your brain when you're feeling down.' "
In one sense, the new study merely confirms the results of early research on animals, says Dr. Joshua Gordon, who directs the National Institute of Mental Health. "It's finding a circuit, a piece of the brain that we kind of already knew was involved in mood — that's the less-than-wow part," he says. "The wow part is that it's in human beings." 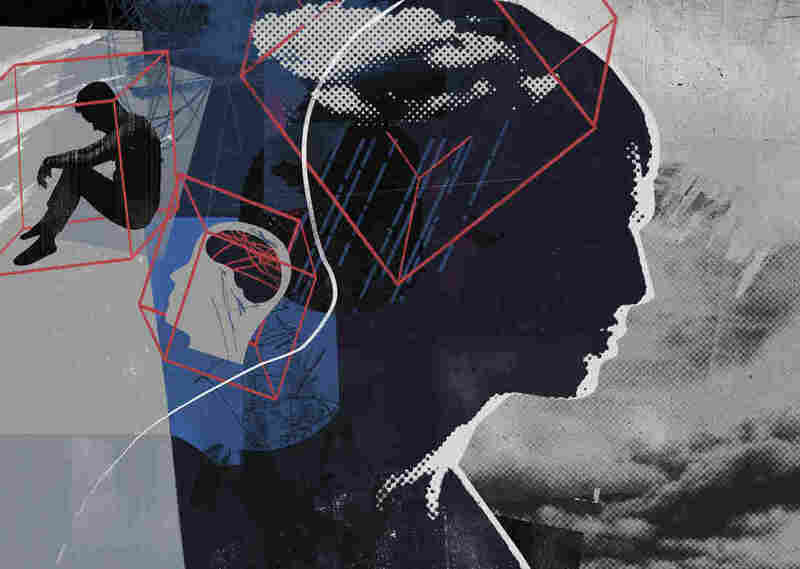 The study also provides a detailed map of what's going on in the human brain, which is what doctors and scientists need to look for better treatments for patients with mood disorders. "It's really important that we find the circuits underlying mood so we can learn more about them and treat them with tools we are developing that are aimed at circuits." Those tools include transcranial magnetic stimulation, which uses pulses of energy delivered through the skull to change the activity of brain circuits. The study also shows the value of the BRAIN Initiative, which was launched by then-President Obama in 2013, Gordon says. "The goals of the BRAIN Initiative are to develop tools we can use to get unprecedented access to, and understanding of, the brain," Gordon says. "This study does both." The research team's funding came in part from the Defense Advanced Research Projects Agency, a major supporter of the BRAIN Initiative.